U.S. Open champion Juan Martin del Potro held off James Blake in a marathon five-setter Wednesday, while Justine Henin advanced in her Grand Slam comeback with a 7-5, 7-6 (6) win over fifth-seeded Elena Dementieva. Fourth-seeded del Potro beat his 30-year-old American rival 6-4, 6-7 (3), 5-7, 6-3, 10-8 in 4 hours, 17 minutes on Hisense Arena, the second showcourt at Melbourne Park, to advance to the third round. Seven-time Grand Slam singles champion Henin, meanwhile, was producing the biggest win of her comeback from 20 months in retirement by defeating Dementieva in the night match on Rod Laver Arena. The second-round win for the unranked Henin was another step closer to a possible quarterfinal match against U.S. Open champion Kim Clijsters, who scored a 6-3, 6-3 win over Tamarine Tanasugarn of Thailand. "It was very emotional for me on the court at the end because there was so much intensity," Henin said. "It's magical to win this kind of match in this kind of atmosphere." It was Clijsters' U.S. Open title only three tournaments back from two years in retirement that inspired Henin, another Belgian, to return to the tour. Rafael Nadal and Andy Roddick continued their paths toward a possible semifinal matchup. But the thread that ties Nadal and Roddick together from 2009 - Roger Federer, who beat Roddick in the semis last year before losing to Nadal in the final - will likely still have something to say about who the eventual champion is on Jan. 31. The top-seeeded Swiss star is on the other side of the draw and couldn't meet either Nadal or Roddick until the final. Nadal breezed to a 6-2, 6-2, 6-2 second-round win over Lukas Lacko of Slovakia while Roddick was defeated Thomaz Bellucci of Brazil 6-3, 6-4, 6-4. Britain's Andy Murray, who could meet Nadal in the quarterfinals, advanced to the third round after beating Marc Gicquel of France 6-1, 6-4, 6-3. Murray is attempting to win his first Grand Slam title and become the first British man in more than 70 years to win a singles major. No. 14 Marin Cilic, who ended French veteran Fabrice Santoro's 70th Grand Slam campaign in the first round, rallied to beat local hope Bernard Tomic in five sets in a center court second-round match that finished after 2 a.m.
Del Potro, who beat Federer in last year's U.S. Open final, had a chance to serve for the match at 6-5 in the fifth after breaking Blake. However, Blake broke back immediately, helped by two errors from the 21-year-old Argentine. 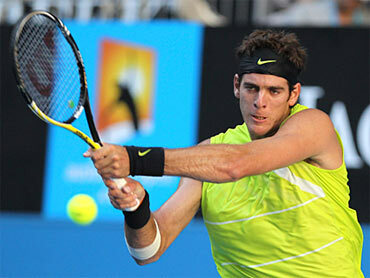 Del Potro again broke Blake for a 9-8 lead and another chance to serve it out. He closed with a big serve out to Blake's backhand side on his first match point. Blake fell to 4-13 in five-set matches. "It's tough to rank them," Blake said of his losses in five sets. "But right now it hurts pretty bad." Del Potro has been bothered by tendinitis in his right wrist that first cropped up late last year and caused him to pull out of the semifinals of the Kooyong exhibition tournament last week. When asked if he was in pain, he said: "A little bit. But I can play." The former No. 1-ranked Roddick took time to review video after the match, and was conciliatory in a news conference that followed. "To be fair, I was more wrong than I thought I was out on court," Roddick said. "It was a lot closer than I thought as far as when the call came. I thought I was going to be 100 percent right." "I played a serious match. I think I played the match I needed to play," the six-time Grand Slam winner said. "I was playing, moving well in the beginning without mistakes, having control of the ball." Clijsters and Henin met in the Brisbane International final nearly two weeks ago, with Clijsters winning a close three-set match in Henin's first official tournament in her comeback. Against Dementieva , Henin had a match point at 5-4 and 40-30 but netted a forehand. Dementieva produced consecutive backhand winners to even the second set. Henin again had a chance to serve for the match but was broken, with Dementieva forcing a tiebreaker and then leading 3-1. The Russian also had a set point in the tiebreaker before Henin won three straight points to finish it off in 2:50. Henin said the appreciative crowd and the scope of her win made her happy she returned to the sport. "The crowd gave me so much, so respectful at the end. That's why I probably came back on the tour, was to live this kind of match." After her match, Clijsters had a few words of warning for Henin after admitting that she doesn't always play her matches "conveniently, but good enough." "But when I had to play well against Justine, I was able to really raise my level," Clijsters said. "That's something that obviously after having been off for a long time, it takes time to get that. I was happy I was able to do that against Justine, and at the Open last year as well." Next up for the 26-year-old Clijsters will be No. 19 Nadia Petrova, one of the Russian women already into the third round along with French Open champion Svetlana Kuznetsova, last year's Australian Open runner-up Dinara Safina and Maria Kirilenko. Third-ranked Kuznetsova beat Anastasia Pavlyuchenkova 6-2, 6-2 and No. 2 Safina had a 6-3, 6-4 win over Barbora Sahlavova Strycova.